WHO 37 - A Doctor Who Podcast: Doctor Who inspired chainmaille by Do Bats Eat Cats? 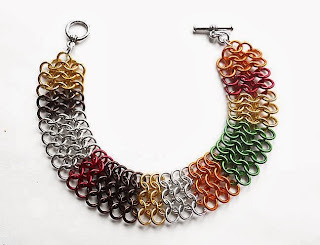 Doctor Who inspired chainmaille by Do Bats Eat Cats? 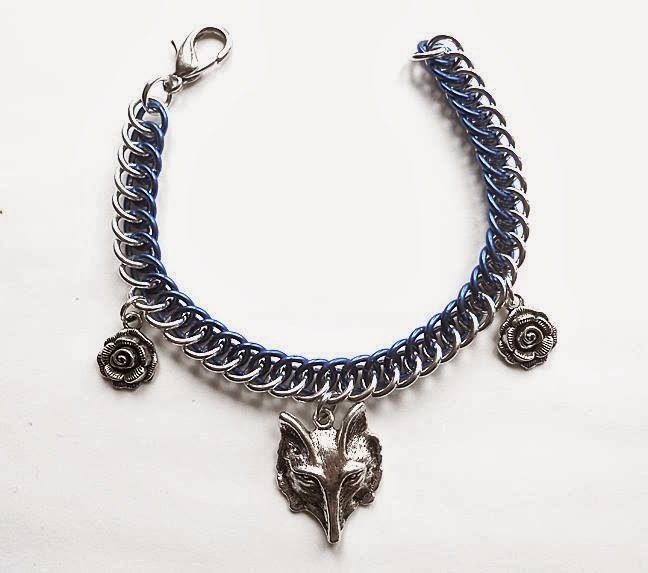 I am proud to present the first two Doctor Who inspired pieces by my girlfriend Darlene, aka Do Bats Eat Cats?, a chainmaille artist who specializes in one-of-a kind gothic and sci-fi/fantasy pieces. 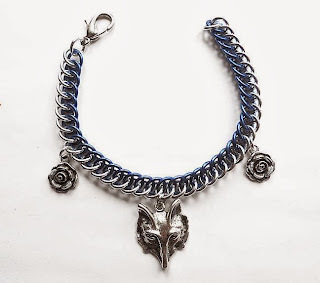 The first piece is "Bad Wolf", which features silver and "TARDIS" blue chain, two rose charms and a wolf's head charm. The second piece is a bracelet done in the style of Tom Baker's scarf. Both pieces are con-exclusive and are not available at her online store. These and many more Doctor Who inspired pieces will be available at Chicago area sci-fi and fantasy conventions this summer. However if you are interested in either piece or if you have any questions, you can contact her via her shop page, or find her on Facebook or Twitter. More pieces will be featured soon. Today she got in a shipment of bow tie charms for a Matt Smith inspired piece.